Liverpool FC, undoubtedly one of the more recognized names in world soccer, has had its long-overdue reawakening. With an unstopabble Suarez, a calm Steven Gerrard and a stout central spine, this team is fun to watch and nearly unstoppable. Liverpool won't stop scoring. That's the long and short of it. With a league-high 88 goals in favor and all of April and May still to go, and a Luis Suarez primed for a record-breaking streak, it's hard to see how this team can be stopped right now. Brendan Rogers has finally turned this team around after lackluster performances for almost a decade. The team has not won a major tournament since the Champions League in 2005 and domestically they have not won the league since the 1980s. Back then they had a dynasty. Lately, they were knocked out of the top four for several years until now. 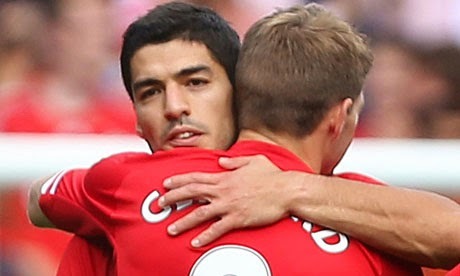 Today's Liverpool is a great respite from the monopolizing Manchester United, Manchester City and Cheslea. And where we might have thought that Arsenal would walk away with the league during the first semester of the tournament, it is now clear that Wenger's team has imploded, paving the way for the Merseyside team. Anfield deserves a major victory after all the work this team has done. From Skrtel to Sturridge, Leiva to Coutinho, this side has a wealth of dedicated stars to support Suarez in his exploits. Whatever happens in April, Liverpool deserves where it is right now at the top of the Premier League table. This is going to be a classic finish to the league and all of us fans of the sport are rooting for the team that scores the most and enjoys the game. Right now that is Liverpool. It's not old news that an American team gets eliminated in the knockout round of the Concacaf Champions League. 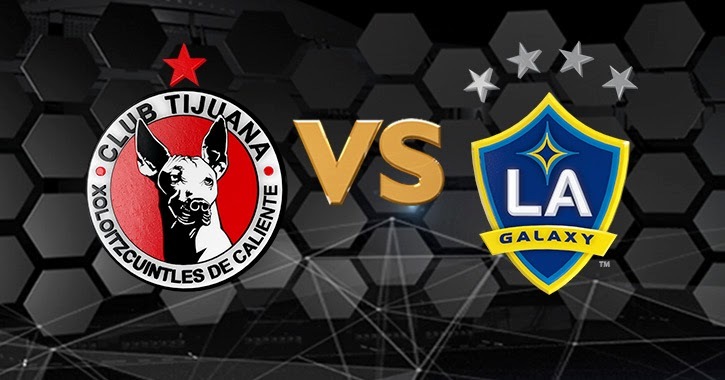 Tonight it was the LA Galaxy's turn at the hand of heavily-talented Xolos of Tijuana. The team was doomed from the start. The reason the team lost wasn't as much by the defense but for the lack of result at home at the StubHub Center. A win by at least two goals would have been enough for the LA squad. And this is a point that Sporting KC will also have to contend when they face Cruz Azul on their return match. It is sad to realize that the league still has ways to go to catch up with other leagues on the international level. Let's remember that Xolos elected not to play with their "full" squad and that their replacements are that much more talented in a very deep pool of players. Hopefully the Galaxy can begin to remedy this with Galaxy II in coming years. Clearly, the influx of talent into the league from the international sphere with players like Defoe, Henry, Dempsey and Bradley is quite impressive, but this is only skin deep. If the league trully wants to compete then it will have to flex more of a financial muscle and not just on two to three players per team. And yes, that could be a problem too, given the fate of NASL and the impending dilution of talent due to the almost perennial expansion of MLS. But we know that it is an imperative for Garber and many American soccer fans to excell in their continental tournament if the league is to become trully exceptional in our lifetime. 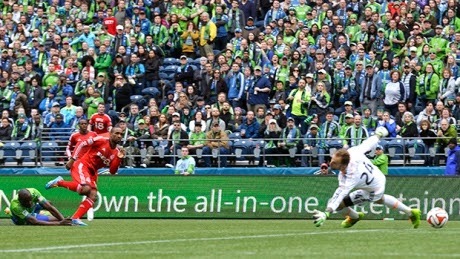 Toronto FC shed its reputation as a minnow in MLS today by going to Seattle and defeating the Pacific Northwest powerhouse 2-1 to earn just the second ever opening day win in the club's eight year history. It was a just score and a credit to what could become a significant team in the league. No one told Jermain Defoe that it would be hard to be a Designated Player in the league, to settle in, to score. No. Two goals in 24 minutes says it all. Defoe is just as much a superstar scorer as he was at Tottenham in the Premier League. As for Michael Bradley, let's just say that there was hardly a play he wasn't involved in. In fact, the man looked like he was still playing for Roma, devoting himself to every tackle and distributing balls that Frencesco Totti would be proud of. Capping it off was a curiously familiar man on goal: Julio Cesar. Yes, Julio Cesar from Brazil. He had the poise on most plays and only Dempsey's deft touch undid his work. But Toronto is much more than these three players. In fact, Gilberto, their third DP, wasn't even on the pitch. The rest of the squad is compensated at a lower rate than the Bradleys and Defoes, but they did a good job tonight. And they are no pushovers either: DeRosario (former MLS MVP), Steven Caldwell, Alvaro Rey, Justin Morrow. Seattle had its marksman finally score. Dempsey had a great opportunity and put it away the way we were accustomed to watching at the Premier League. It is clear, however, that Schmid still had much to work on to make the Sounders as fearful as it is to play at Century Link Field. And yet, would this team be able to go to Seattle and defeat Sigi Schmid's team without Bradley and Defoe? That's the more important question and it is the depth in this squad that counts and why they aren't quite yet a superclub. The rise of MLS development is here and the marquee clubs are setting the stage for it. The Red Bulls just announced that they would begin the process of creating a secondary feeder team in the USL Pro. This is not without precedent since the Galaxy II was just formed a few weeks ago. If this sounds familiar to those that follow international soccer it's because great teams in other leagues around the world also have this type of setup: Barcelona B, Bayern Munich B and so on. Indeed, it's quite a step for MLS teams. The "b" teams we are talking about have given us players like Pedro, Giovanni dos Santos, and the great Carles Puyol, who came up from Barcelona C to become one of the greatest central defenders of all time. Recently, players like Terrence Boyd and USA prospect Julian Green have come up the ranks from Borussia Dortmund and Bayern Munich. The former landed a starting (and successful) role at Rapid Wien of the Austria Bundesliga while the latter made his first full-team appearance in a Champions League match with Bayern. It is no secret that MLS teams have had partnerships with lower division teams for player loans in order to get young players valuable playing time. Such was the case with individuals like Seaton and Dykstra for DC united and the Richmond Kickers. Just as the great leagues in the past have move forward with new, clear and groundbreaking developments, so does Major League Soccer. Still in its second decade, the league is advancing step by step to catch up to the rest of the soccer world. Major League Soccer is now experiencing what we might term its third age. A time after the Beckham era. The influx of highly talented designated players continues, as does the repatriation of in-prime US internationals like Dempsey and Bradley. The projected increase of teams to 24 by the end of the decade calls for an increase in the talent pool. 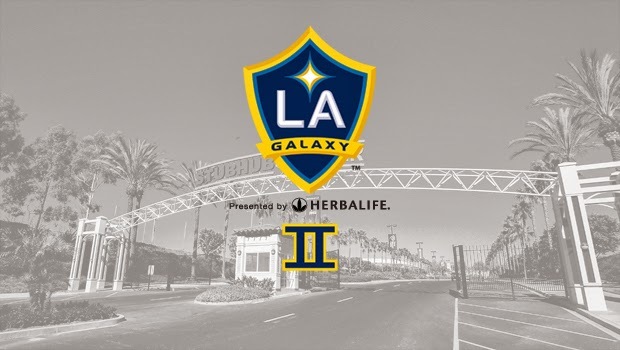 The Galaxy and Red Bull are now leading the way with their developmental "B" sides to ensure they can have the tools to meet the demand and are once again doing the trailblazing for the league. 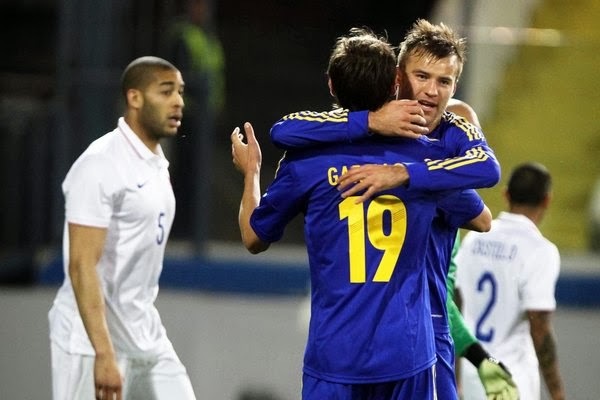 The USA lost its FIFA international date match versus the Ukraine mostly due to players unfamiliar with one another. Ukraine seemed inspired with the tragic backdrop of their torn nation. This, perhaps, was a dignified result for the game. The negatives were the inexperience shown by John Brooks and rustiness presented by Onyewu. It was clear that this was a highly-experimental Europe-based crew that served to showcase the different individuals plying their trade in the old continent. It's clear that the Gonzalez-Besler tandem is here to stay as the center backs and everyone else from Brooks to Onyewu to Ream is auditioning for the backup role. Do keep in mind that DeMerrit was a backup last Wrold Cup and played the hero when Onyewu was struggling. Klinsmann's biggest ideas played out in the midfield, where he slotted Fabian Johnson on the left flank and Kljestan in the middle. Does Kljestan still have a chance in this group? And is Fabian Johnson not the best left back option? It seems that Klinsmann would really want him in the midfield but has no reliable options to cover the left defensive position. Sound familiar? Barring any injuries, Fabian Johnson is likely to remain with the back four. The rest of the midfield is still a question mark with the different lineups the German coach has tried. What happens when Zusi and Donovan return? 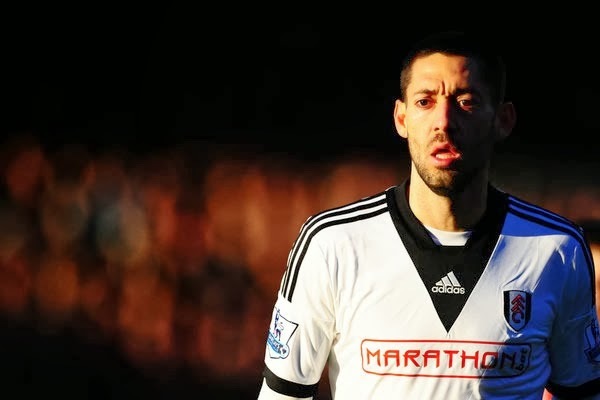 Where does Dempsey fit in if he's not a withdrawn forward? And what about Bedoya and Diskerud? And then there's the central midfield role. Michael Bradley, barring injury, is an undisputed starter. Jermaine Jones is likely to be his partner, but a diamond formation would pose interesting problems. Do they both remain box-to-box players? Who takes more of a defensive role? Last night it was partly due to Jones that Ukraine got their first goal. There was no help from the central midfield. With Maurice Edu out for now, it comes down to Kyle Beckermann as a backup, with Brad Evans or Geoff Cameron able to shift to that role. Danny Williams has suddenly seen his stock rise with a good game versus Ukraine and a starting role with Championship side Reading. Beckermann better show up for the Mexico game in April. The forward situation did not get any help from yesterday's game except to say this: Jozy is in trouble and Johannsson is the answer. Altidore had one clear chance at goal but it went wide like so many chances for Sunderland this season. Tough times for the youngster. Aron Johannsson almost made it a rescueable game for the Americans late in the match. His shot was saved by the defender on the goal line. He's a poacher and we need him. We do wish we had seen more of Agudelo and Boyd, especially the latter. Hopefully they will get some chances in the upcoming friendlies. Clint Dempsey took Juergen Klinsmann's advice. 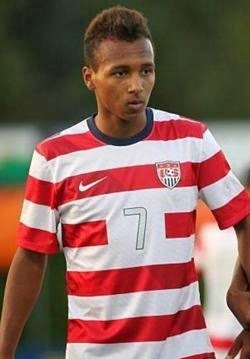 He used his time off from MLS to go on loan to English Premier League side Fulham. It was a return of a hero. A chance to play and regain confidence after an unconvincing time in Seattle. The loan started with a promise and ended with a quiet goodbye. Back in 2010 there was another high-profile US National Team loan: Landon Donovan to Everton. He scored, he assisted, he did not disappoint. So what's the difference between these two highly-rated players in their loan to the Premiership? For one, Dempsey is older now than Donovan was during his loan to Everton during the winter months of 2010. And although that should not be a pretext, it should be considered a factor. Dempsey had an underwhelming campaign with the Sounders where he finished with just one goal when it was assumed they would come in bunches as it had for Fulham and Tottenham. Landon Donovan was in his prime in 2010 in what became a career year for him in the international stage. He was the savior of the national team on two occasions in the World Cup and continued on pace to become the highest-scoring player ever to suit up for the American side. So when Everton came knocking he was ready to go, fans bought Donovan Everton jerseys that would last only two months of relevance and he was a force on the pitch as a striker for David Moyes. Should national team fans be worried about Dempsey? After all, this is their team captain and one whose goals they have learned to count on for many years now. With him and a struggling Altidore we're beginning to wonder just what this team would look like if either of these players fail to make an impact. But what are the positives for Dempsey? He stayed active. He played in one of the world's top leagues. He remained relevant in Europe, as odd as that may sound. Dempsey thrives on competition. He excels versus talented squads like Chelsea, Manchester United, England or Italy. If anything, this loan likely recharged his batteries for Seattle during a season in which they desperately need to win a trophy. So Klinsmann has at least had his captain playing at the highest level during the MLS offseason. It was no flop with Fulham, the team is in a tailspin right now and threatened with relegation. There was no flair either, however. We'll see just how good Dempsey looks with the American squad versus the Ukraine today.